It all began back in the mid 90's when I Self Devine and DJ Kool Akiem formed an alliance under the name Micranots. Years later after 3 incredibley charged albums and and EP they parted ways with each other. 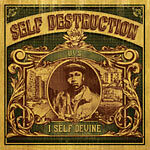 Now begins the next era....I Self Devine, same MC, same fiercly spit flow, just different musical approach. Production by Jake One, Vitamin D, ANT (Atmosphere), Bean One, Dj Fu-Manchu, Benzilla & Medium Zach.